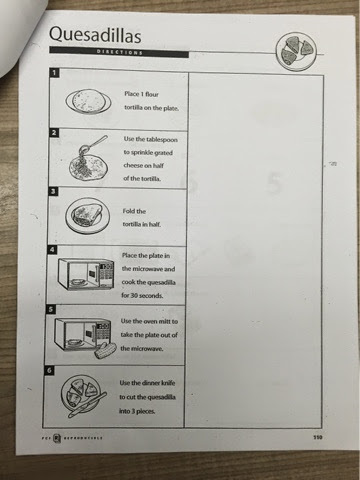 Does anyone else use Cooking to Learn in their classroom? I love their recipes! Most of the time they are great, with simple details and descriptive pictures so that even my non-readers can follow the directions without verbal prompts from staff. Most recently, we made quesadillas. It was super simple, putting cheese on a tortilla, folding, and microwaving. But simple is my favorite because it means more independence!!! 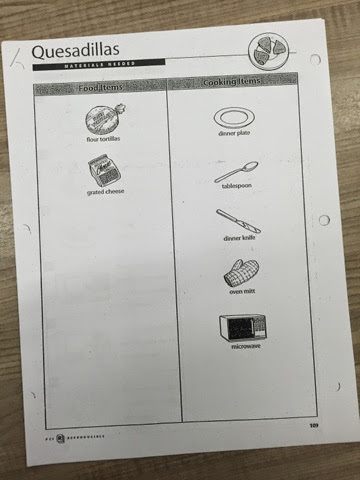 Plus, Cooking to Learn has comprehension questions in various forms to use after making the meal so you can work on some reading, writing and comprehension skills as well. Before I have students make something, I usually like to show them a video on how it's made or at least the step by step pictures from wiki-how or something like that. I couldn't find anything for this one, so I decided to make my own and was surprised about just how easy it was to do! You can check out our video below or here on YouTube. I used the Kizoa website to make the video with my class after we made our quesadillas and it was very easy to use. As a class, we put the photos in order and then added a short description for each one. Now, if I am going to make cheese quesadillas again for my class, we can watch the video and pause to discuss each step if needed. I hope you will find this video or even just the video tool maker helpful in your classes as well! I have used Cooking to learn many times and I love the simplicity of it. I have a student this year who is gluten and casein free, so we haven't done as much cooking as in previous years. I've never thought to doc a video, what an awesome idea! Love it! We had an inservice a few weeks ago that did a whole afternoon on video modeling. We are in the plans of doing a few though my boss says we can't share them. I think the kids are really going to love it. Great job!